The State Department struggled on Wednesday to answer a flurry of questions from reporters regarding recent reports that Iran’s nuclear stockpile has significantly expanded in recent months, constituting a potential violation of past agreements made with the United States. For the second day in a row, State Department Spokeswoman Marie Harf faced pointed questions about Iran’s growing nuclear stockpile for around 15 minutes. The questions followed strong denials by the Obama administration on Tuesday regarding a New York Times report disclosing that Iran’s stockpiles of nuclear materials had grown 20 percent during the last 18 months. Such a growth in Iran’s nuclear stockpile—which was initially discovered by United Nations inspectors—is viewed by some as a violation of an interim nuclear deal struck with Western powers in 2013. The Obama administration has repeatedly touted that deal as completely freezing the most controversial aspects of the Islamic Republic’s nuclear program. After claiming on Tuesday that the administration was "totally perplexed" by the "inaccurate" Times report, Harf went on to engage in a lengthy Twitter debate about the topic on Wednesday morning. Harf singled out the story’s author, Times reporter David Sanger, and criticized the Washington Free Beacon for reporting on her initial exchange with State Department reporters. The pointed exchange between Harf and reporters continued Wednesday afternoon during the State Department’s daily briefing. Harf faced multiple questions about Iran’s increased nuclear stockpile and went on to dismiss concerns that it could impede negotiations, which are set to conclude at the end of June. Iran is required under the interim nuclear deal to freeze and dilute its stockpiles of low-level enriched uranium, the key component in a nuclear bomb. Its stockpile has reportedly grown from around 7,650 kilograms at the start of the deal 18-months ago to around 12,000 kilograms currently, according to nuclear analysts and the International Atomic Energy Agency’s (IAEA) most recent reports. While Iran is required to dilute that excess amount, it has only done so to about 5 percent of the current stockpiles, leading to questions about whether the Islamic Republic will be in violation of previous agreements by the end of June. Analysts predict that it will be impossible for Iran to hit the mark in the next 28 days, when it is obligated to be back at 7,650 kilograms of low enriched uranium. Harf continued to dismiss concerns about the issue on Wednesday, saying the United States is not worried about Iran’s ability to dilute enough uranium before the deadline. "There’s a couple, I think, notions in the story that we disagree with. One being—I think it was the second paragraph—that Western officials are unaware of why this is happening," Harf said. "That's just not the case. This type of stockpile under the JPLA and the extensions can go up and down." "That is perfectly acceptable, as long as at the end of the time period, which in this case is June 30th, it's back below 7,650 kilograms," she said. 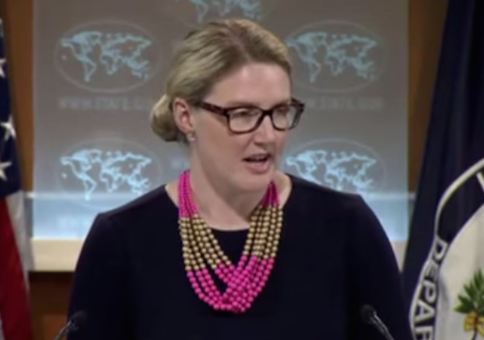 There is nothing wrong with Iran increasing its nuclear stockpile, Harf insisted. "I think one of the biggest notions is it made—it insinuated strongly that they were doing something they shouldn't be doing by raising the stockpile," she told reporters. "That’s not accurate." The issue also is not impacting ongoing negotiations, Harf said. "The notion that this is a major obstacle, a diplomatic obstacle inside the room; talking to Undersecretary Sherman, other of our top negotiators, this isn't," Harf said. "This issue, again, is perfectly acceptable. It can go up and down." Iran is permitted to sell its low-enrichment uranium on the open market in order to meet the base number required under the interim deal, Harf said. The reported increase in nuclear material is part of "normal fluctuations," Harf added. "And they’ve always gotten back where they needed to be." Reporters responded to Harf’s attempts to downplay the issue with confusion and skepticism. "Marie, I'm sorry, I just can’t—I don’t understand why this isn't more of a concern," said Associated Press reporter Matt Lee. "If we’re only 28 days or so away from a deal, wouldn’t you be expecting the Iranians to be reducing their—their stockpiles to get in line." Harf responded that Iran would eventually get its stockpile down to 300 kilograms, describing this as a "meta-point" that people "aren’t paying maybe enough attention to." White House Deputy National Security Adviser Ben Rhodes also defended Iran on Wednesday. This entry was posted in National Security and tagged Iran, Marie Harf, Nuclear Weapons. Bookmark the permalink.